When the Maseko Ngoni settled in Domwe c.1870 their society had already been shaped by almost fifty years of warfare and migrations. The army, organized on an age-set principle, brought together 'captives from the march' with different tribal backgrounds. To avoid bids-for power by close relatives of the paramount alumuzana and izinduna, who occupied the positions of political power within the state, were chosen not from the royal family but from members of the aristocratic Swazi clans. Such leaders, chosen for loyalty to the paramount, extended his rule over assimilated groups and minimized the danger of local revolts. Religious office as held by members of minor clans and recently assimilated groups whose role in society was strictly circumscribed. In short, as the Maseko made their permanent settlement around Domwe mountain in the Dedza district of Malawi, they formed a tightly knit, centralized society based on the strength, both military and social, of a well-trained army. The internal vigour and potential for expansion of this system was apparent during the heyday of Maseko power between 1870-85. Its weakness and inability to respond to changing circumstances became equally evident in the last fifteen years of the nineteenth century. The division of the period 1870-1900 into the categories 'rise' and 'fall' is simple, though unoriginal, but corresponds broadly with the facts. The Dedza district formed the periphery of Mpezeni's raiding territory and there seems to have been an initial degree of overlap between the two Ngoni kingdoms. The Fort Jameson (now known as Chipata) Ngoni appear to have attacked Domwe at least once, and there is evidence that Magwambane, a cousin of Mpezeni, was killed during one such abortive raid.3 The Maseko themselves were raiding mainly in an arc to the east of Domwe, extending from Nkhoma in the North to South of the Shire. Ntumba, Chipeta, Nyanja and Mbo villages were brought under Ngoni rule. Few Chewa villages managed to withstand the Ngoni onslaughts unless they were fortunate enough to occupy relatively impregnable positions, such as the top of Chirenje mountain where Chief Odete held out until dislodged by British cannon in 1898. The more gently sloping mountain opposite Chirenje, and rising above Kasina mission,known significantly by older people as 'Chidiaonga',4 has the remains of a burnt-out village still visible on its summit. The impressive Ngoni advance, reaching even to the sacred groves of Buchanan's coffee plantation, was cut short at Mkanda hill, where a stand by the Yao, backed up with strong fire-power and watched by the Church of Scotland missionaries, had a group of the Maseko retreating through Blantyre. This massive trans-Shire raid was a harbinger of future events; in the face of superior Yao fire-power the Maseko could be thrown into disarray. The Maseko found themselves on the edge of a major slave route that stretched from Mwase Kasungu's in the north to the coastal ports of Mozambique and southern Tanzania. This was not entirely to their disadvantage. The large numbers of Chewa-speaking groups falling under Ngoni hegemony from 1870 onwards risked swamping Maseko society with captives that could only be absorbed with difficulty. The slave trade with the lakeshore Yao and Chikunda middlemen from the Zambezi valley offered a convenient method for disposing of the unassimilable and the socially undesirable. This pressure from Chewa groups with their alien traditions and social organization might account for the centralization of Chikusi's kingdom that began during this period; his capital, Liwisini, was to grow considerably in size.9 This concentration of population may have been forced on the paramount by the few aristocratic Swazi-clan members at his disposal. Hawes observed in 1886 that: 'Of the real Angoni, with the exception of the King, his numerous wives and family, the Chiefs of districts and towns, and the Head men of villages, but few exist. '10 This aristocracy had to serve a kingdom that extended from Domwe to Mpimbi, on the Shire, and the edge of the Phirilongwe forest, as well as to an ill-defined extent westwards. To make his presence felt even more the paramount took up residence in each of his major villages for a period of the year. Perhaps the most serious defect of the Maseko custom of passing over the amakosana in the choice of leading indunas was that disaffected members of the royal family were given little incentive to support the paramount. Coupled with this there was the problem of the regency; on the death of the regent his son was passed over in favour of the legitimate patrilineal heir to the paramountcy. For the son of Chidiaonga, a regent who had been in power during the long march from Songea to Dedza and had established the Domwe settlement, the sight of a young cousin as paramount must have been extremely galling. Chifisi, Chidiaonga's son, had every reason for disentangling his segment from Chikusi's jurisdiction. With fortified villages along the Shire and the Blantyre area dominated by the Church of Scotland missionaries, it is not surprising that both Maseko leaders turned their attention to the old Mpinganjila crossing between the two lakes, where the self-titled Mponda II had made his stockade.13 This part of the Shire was not only a weak link in the slave route to Angoche but, owing to the Chungwarungwaru war between Mponda II and his relatives, a weak point in Machinga control of the southern end of the lake. These remarks can profitably be contrasted with those of occasional visitors to the Ngoni such as Johnston and Hawes. Johnston's preconceptions were surely clouding his judgment when he expatiated on how Chikusi was 'by far the most powerful chief between the Zambezi and Lake Nyasa'.19 Similarly four years earlier in 1886 Hawes was writing: 'It is undoubted owing to the despotic sway of the King that Angoni Land is kept under sue complete control. He has absolute power...'20 The fascination of both administrators and missionaries with what they took to be the Ngoni ubermensch says a lot for the darker recesses of the Victorian mind. The year 1891 was a turning point for the Maseko Ngoni. Chifisi died in March and Chikusi in August, the last of the leaders moulded by the rigours of the Mfecane. With the Portuguese threat countered and Johnston as official Consul, planters began to come into the Shire highlands at a steady trickle. The rate is conveniently reflected in the rising cost of land, from a penny per acre in 1890 to two shillings and sixpence in 1893 with some plots in Blantyre going for up to £20 per acre.21 The few Ngoni labourers who had come down to build Blantyre cathedral in the 1880s became hundreds, working as porters up and down the Shire, or as seasonal plantation labour. The Maseko had begun to lose their credibility,22 not only in the eyes of the Yao but, more insidiously, in the sight of their own Chewa bondsmen. Chifisi was succeeded by his eldest son, Pasekupe, known as Kachindamoto, who was then barely fifteen years old, while an equally youthful Gomani was established as paramount. An attack by Gomani on Kachindamoto was repulsed on a hill at Masasa's along the Ntcheu-Dedza road, called Mwala-wa-Nkhondo, but later in the year Kachindamoto's main village, Muchokozwa was successfully sacked.23 Both chiefs had an immediate need to prove their capabilities in warfare before their people. One advantage for the Maseko of the continuing warfare against the Yao, and even the civil war, was that their regiments were kept active and trained in combat. The heart of Ngoni society, the army, was kept ticking over, not with impressive victories, captives and rich herds as of old, but at least enough to keep up morale. There was no other alternative once the Kirk Range began o 'dry up' and raids became increasingly more difficult and less profitable. It was already a losing battle as more and more Chewa `Ngoni' began slipping away in the Yao and European economies. Finding Ngoni society anything but invincible many people were looking to other centres of power and prestige. The pull of the European economy was certainly greater. According to the editor of the B.C.A. Gazette: 'The help which is afforded this country by the Spring rush of the Ngoni, who after the crops are finished come down here for three to four months' work, was well demonstated in 1893.26 The influx of Ngoni labour had, in fact, become essential to the coffee and tobacco planters; with wages at five to six shillings the Ngoni provided a pool of cheap labour for crops yielding a small margin of profit. The presence of the British saved Kachindamoto. Mpemba who had been in pursuit held off and on 31 October Ndindi came in apologetically to explain that he had fought only through fear of Tambala. Not surprisingly Kachindamoto pressed for a fort to be built in his new villages at Ntakataka, and for Edwards to negotiate a ceasefire. After a visit to Gomani, 22 November was set as the date for a meeting and a reluctant and disbelieving Kachindamoto limped across the mountain to Masasa's in the Dedza plain with his remaining warriors. There a scene of colonial high force was enacted as the two young chiefs were obliged to shake hands in front of a crowd of over 6,000 warriors, and under the approving gaze of the Revs. Robertson and Murray of the Dutch Reformed Church. The missionaries were far from being mere onlookers at the colonial spectacle. 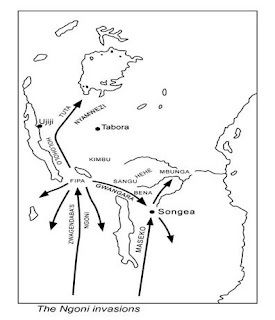 Mission stations had multiplied in Central Angoniland, with Europeans at Livlezi, Mvera, Goa, Ntonda, Chioli and Pantumba. Many of Gomani's villages were beginning to slip into the orbit of the missions. The Europeans presence meant a serious curtailment of further raiding and recruitment into the army. Equally challenging for Gomani, the efficiency and extent of B.C.A. government tax collecting was improving throughout Nyasaland. The £790 collected as but tax in 1892 had risen to £4,696 by the end of 1895.32 At a rate of three shillings per hut this represented more than 6oo medium-sized villages under British control; the tax, levied on many villages that had been under Ngoni jurisdiction for twenty-five years, could only be considered an improper tribute paid to the British. Towards the end of 1895 reports were reaching Zomba that Gomani had been buying guns and gunpowder from Zambezi traders and harassing villages paying but tax. After an attempt by Gomani to enlist the support of Chiwere, a neighbouring Ngoni chief to the north-east, had failed owing to pressure from Dutch Reformed missionaries, the attacks came on 6 October 1896 and were centred predictably on mission stations and villages that had been paying hut tax. In the words of Chief Ganya of Kandeu : 'Chief Gomani was angry that the women who lived at the Goa mission wore "luvi" feathers in their hats. He went to the mission to tell them to take them off. '33 If it is recalled that `luvi' feathers in the head-dress were a symbol of the paramount's power, this account of events becomes delightfully analytic. Villages paying hut tax under mission influence were flaunting Gomani's authority. The two ladies at Gowa were, indeed, a challenge. From the insignificant resistance put up by the Maseko, and Gomani's naïve insistence on his ownership of the people over which he had had traditional jurisdiction, it can only be inferred that the British assault came as a surprise. The attacks on the mission villages seem to have been a gesture by Gomani to his people and older indunas to show that the position of the Ngoni aristocracy over their conquered territory had not changed. This was, of course, not the case. A number of reports from the missions mentioned the discovery of such things as dummies with spears through them and magic gates after the attacks, further proof that Chewa influence on Ngoni society had extended to the practice of preventive magic in warfare. In April 1898 Msekandiwana, who lived on Domwe mountain itself, thirty miles to the north of Mandala, gathered together over 6,000 men and called on Mandala's assistance in what was to be the last desperate attempt of the Maseko to keep alive their former way of life. Mandala was unavailable, embroiled in a battle with Njobvualema and Nkwaila who had rebelled at the repeated abductions from their villages. Two companies of Tonga and Sikh troops converged on Domwe under the leadership of Pearce and Brogden, and, after meeting stiff resistance, put down the rising. From Lieutenant Brogden's fulsome report it is clear that the Maseko had, at last, learnt the value of heavy fire-power. 'They were armed almost entirely with guns and attacked up vigorously, advancing to within 20-30 yards and opening fire on us. '39 But they missed their chance. The last resistance of the Maseko as an organized army ended when Msekandiwana shot himself through the chest to avoid Gomani's ignominious death by execution. However, with an end to raiding came an end to the periodic influx of cattle into the chief's kraal. Like Mandala, Kachindamoto found himself without the old advantages of leadership in a martial society. He also resorted to the solution of selling off recalcitrant members of his villages to replace the booty of war. Makanjila, who continued slaving into the twentieth century, was a willing buyer. And so with this wave of suicides, risings and executions the Maseko Ngoni passed from history as a martial society. No single factor was the cause of this rapid decline. Perhaps the most important had been the pressures from the Yao and European economies with their slavery and wage labour. Behind the economies had been their techniques of warfare. Although the Ngoni appear to have known how to make crude muzzle-loaders,45 and traded and captured a considerable number in the 1890s, it was only by about 1898 that they had learnt to use them efficiently. It is hard to know whether this was merely another instance of military crassness, a quality one might reasonably suppose to be universal, or a product of the essential conservatism of Ngoni society. This conservatism was most likely to be apparent in the army, the basis of the maseko social system. On the other hand, the Ngoni aristocracy were undoubtedly threatened by the grass-roots disruption associated with the assimilation of large numbers of Chewa captives. The influence of Chewa wives, with strong and fixed ideas on child rearing and family structure46 had from 1870 a whole generation to take effect. A large percentage of young men fighting in the 1890s would have had Chewa mothers. This clash of matrilineal Chewa with the patrilineal Ngoni must have generated more tensions within society than the assimilation of the patrilineal northern Tumbuka by the Mbelwa Ngoni in the north of Malawi. Ngoni aristocracy therefore had very good reasons for reacting conservatively. While the fragmented remains of the Maravi confederation presented no political and military threat—there were no risings as in the north—the aristocracy faced a far more insidious erosion of Ngoni society, culture and language. By 1898 Chingoni was rare in the Central Region.47 Read's comparative study of Gomani's and Mbelwa's Ngoni provides impressive evidence of the degree to which the Chewa were successful in imposing their cultural patterns while remaining a 'conquered' people. An attitude of conservatism amongst the indunas was therefore entirely rational. It only became catastrophie when it was extended, as it was bound to be, to include military tactics. In oral traditions the choice between peace and continued warfare was presented as a choice between remaining Ngoni or becoming Chewa. The Maseko defeat at Songea was attributed to Mlangeni's decision to settle peacefully amongst the Chewa near Ncheu in the 1840s. The Chewa correlate of this theme is the often heard statement 'we defeated them with our women'. 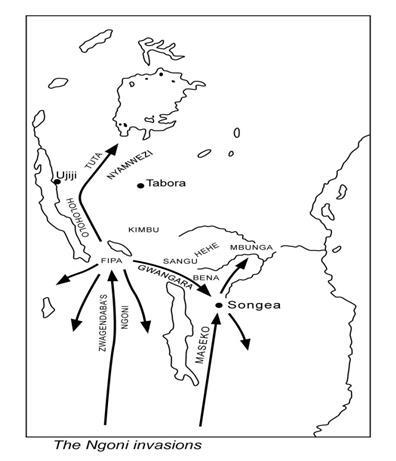 There seems to be little doubt that the last of the Karonga, Sosola, did Accompany Chidiaonga to Songea and the gist of almost all oral traditions is how the Chewa repeatedly hoodwinked the Ngoni, firstly in alliances of convenience and then in vassalage. The conclusion that the leaders of the major Maseko war divisions saw continued warfare as a defence against Chewa-ization of their society is hard to escape. Finally there comes the element of bluff. Just as the British, so the Ngoni succeeded in subduing a very large number of people with a minimum of direct rule. This depended to a large degree on a myth of invincibility. Once this myth was seen through, and here the Yao seem to have beaten the British by several years, the Ngoni faced what today might be called a 'credibility gap'. Add to this the temptation for indunas to deal privately with the Yao, the weakness of the regency, the proximity of the European and Yao economies, the divisive and debilitating civil war, and the rapid decline of the Maseko Ngoni after 1885 becomes almost inevitable. This is not to say, though, that the Maseko disintegrated as a people as they entered the twentieth century. Before 1929 the heirs to the leaders of the previous century, Philip Gomani and Abraham Kachindamoto, had been converted to Christianity. Judicious support of missionaries and government officials allowed them to retain much of their former power. Nonetheless the years 1870-1900 demonstrate clearly how a combination of factors was able to destroy the way of life of a society that was, in the final analysis, more adapted to the rigours of the Mfecane, than to the problems of settlement close to the British and Yao guns and economies. 1.All foreign office references have been taken from the microfilm collection, Chancellor College Library, University of Malawi. Oral testimonies were taken down as notes during field work in the Dedza and Mchinji districts 1967-69. I am indebted to Mr J. K. Rennie for his scholarly criticisms of; in earlier draft of this MS. Mission references are translated from the French. 2. M. Read, The Ngoni of Nyasaland, (London 1956), 97. 3. Oral Testimony from Nyathei, regentess at Ntakataka 1899-1911 in Manser-Bartlett papers, Chancellor College Library, University of Malawi. 4. Personal communication from Rev. J. Saffroy, W.F. 5. W. H. J. Rangeley, 'The Makololo of Dr Livingstone', Nyasa. J. 12 (I), 1959, 59. 6. E. D. Young, Nyassa (London 1877), 61. 7. Rangeley, 'The Makololo', 59. 8. A. C. Ross, 'Origins and Development of the Church of Scotland Mission at Blantyre, Nyasaland 1875-1926', Ph.D. thesis, University of Edinburgh (1968), 124. 9. As judged by the differences between Hawes to Roseberry, a description in 1886: F.O. 541/50 Hawes to Roseberry, 7 July 1886 and reports from Machinga Yao returning from raids: Mponda Mission Diary, 11 May 1891. 10. Hawes to Roseberry, 7 July 1886. 11. J. Omer-Cooper, 'Aspects of political change in the nineteenth-century Mfecane', L. Thompson (ed. ), African Societies in southern Africa, (London 1969), 224. 12. The Maseko were defeated at Songea by the sons of Zulu, Hawai and Chipeta in alliance with the Bena, Nindi, Pangwa and other subject tribes. I. Linden, 'Some oral traditions of the Maseko Ngoni', forthcoming publication. 13. W. H. J. Rangeley, 'The Amacinga Yao', Nyasa. f., 1962, 54. 14. Hawes to Roseberry, 7 July 1886. 15. Msano was the name given to the mother of the chief, who in the matrilineal Yao had considerable power. 16. Mponda Mission Diary, 22 January 1891. Bishop's Archives, Lilongwe. 17. Mponda Mission Diary, 1 May 1891. 18. Mponda Mission Diary, 25 March 1891. 19. F.O. 84/2052, Johnston to Salisbury, 10 June 1890. 20. Hawes to Roseberry, 7 July 1886. 21. F.O. 2/54, Johnston to Anderson, 21 January 1893. 22. I am indebted to Rev. Tom Price who when asked his opinion on the decline of the Maseko replied much to the point: `Och, they just lost their credibility'. 24. H. H. Johnston, British Central Africa (London 1897), 106. 25. B.C.A.G 20 February 1894, Nicholl. 26. B.C.A.G. 15 July 1895 Editorial. 27. B.C.A.G. 15 July 1895, Editorial. 28. B.C.A.G. 1 December 1895. 29. Oral Testimonies. Chief Mpemba and Ndindi. Manser-Bartlett papers. 30. Oral Testimony. Samson Kachindamoto. Ntaka-taka, May 1969. 31. F.O. 2/68. Edwards to Acting Consul 31 October 1894. 32. B.C.A.G. 7 March 1894 and B.C.A.G. 1 June 1896. 33. I am indebted to Rev. H. Vernooy W.F. Kandeu Mission for this story. 34. F.O. 2/108 Sharpe to Salisbury 18 October 1896. 35 J. K. Rennie, 'The Ngoni States and European Intrusion', E. Stokes and R. Brown (eds.) The Zambesian Past, (Manchester 1966), 321. 36. B.C.A.G. 15 October 1896, B.C.A.G. 1 November 1896, Genthe. 37. Read, The Ngoni, 106. 38. F.O. 2/147 Manning to Salisbury 22 April 1898. 39. F.O. 2/147 Pearce to Manning 15 May 1898, Brogden to Manning 17 May 1898. 40. B.C.A.G. 15 September 1896. 41. B.C.A.G. 12 November 1898. 42. Oral Testimony. Pio Kupempha. Nyanja, Ntakataka, Jakobi Mbalule, Ntumba, Gwaza's Bembeke. May 1969. 43. Oral Testimony. Jakobi Mbalule. Eye witness. May 1969. 44. Mua Mission Diary 1902-1911. 45. Oral Testimony. T. Kabanga-Ndau. Chief Induna at Makwangwala's, Dzunje. October 1968. 46. M. Read, Children of their Fathers, (London 1959), 63. 47. Codrington, R. 'The Central Angoniland District of the British Central African Protectorate' Geograph. F., 2, 1898, 512. 48. I am indebted to Dr Andrew Roberts for this suggestion. 49. Kautsiri, Nyathei's husband. Manser-Bartlett papers. 50. Mua Mission Diary 14 September 1902. 51. Mua Mission Diary 1930-45. 52. J. M. Schoffeleers and I. Linden, 'The resistance of the Nyau cult to the Catholic missions in Malawi', Dar es Salaam Conf. June 1970. 53. W. E. Rau, 'The Ngoni diaspora and religious interaction in East and Central Africa'. Seminar paper, U.C.L.A.